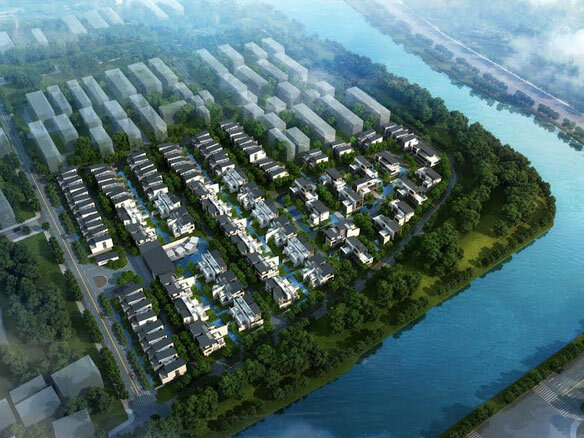 Cordogan Clark & Associates is providing master plan and architectural design for a multi-family villa site in Suzhou, China. This master plan and design for a prominent and historically sensitive site integrates water, nature, and architecture. It respects key elements of the local design tradition, while bringing it new life for the 21st century. The structural clarity of Suzhou and the Jiangsu Province's traditional architecture is complemented by a playful and even sensual approach to detail. I. M. Pei, coming from a profound background that combined an appreciation of traditional Chinese architecture with the Bauhaus and modern design, distilled Jiangsu Province architecture to its essence at the nearby Suzhou Museum. We have paid special attention to these precedents in developing a design that is uniquely appropriate for Suzhou. The intent is to use design variety with a consistent vocabulary to create a “sense of place”. This is similar to the variety of traditional Jiangsu Province architecture, where it seems that individual craftsmen have a playful spirit in their approach to their work, and the different buildings are all talking to one another and to us in the same dialogue, while saying different things. The main entrance gate establishes a theme that recurs, with many variations, throughout the development. This motif is strong, yet flexible enough to allow many variations. Repetition and variation on the theme of this motif strengthens the overall composition, as in a piece of classical music.